As opposition boycotts controversial debates, Deri threatens hareidi support for withdrawals as 'revenge' against Religious Zionists. The Knesset Opposition decided to respond to three controversial bills being discussed this week by boycotting the debates, and holding its own discussions separately. The boycott opposed how coalition MKs were called on to pledge they would vote for the laws, and for the limited timeframe of debates. The bills to be discussed this week include the Governance Bill, significantly raising the voting threshold and endangering small Knesset parties; the Enlistment Bill, sending hareidi yeshiva students to the draft for the first time in Israel’s history; and the National Referendum Bill, requiring a national referendum on Israeli land withdrawals. That bill does not include Judea and Samaria, as they are not currently under Israeli sovereignty, but would cover land-swaps. In the alternative Opposition meeting, held at the Knesset's Negev Hall, Arab, hareidi and leftist MKs united to attack the government. 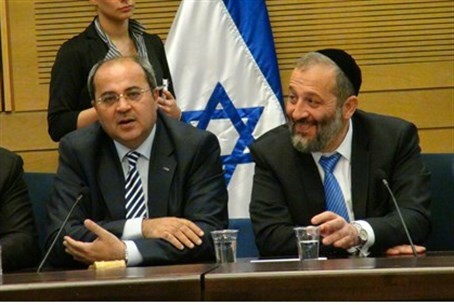 Hareidi MK Aryeh Deri, chairman of the Shas party, hinted that his constituency may take revenge on the religious Zionist movement for the hareidi enlistment law, which has been pushed by Finance Minister Yair Lapid, erstwhile ally of Economic Minister Naftali Bennett. Deri attacked Bennett, who initiated the referendum law and who has threatened to leave the coalition to prevent withdrawals, hinting that Bennett's moves may have turned the hareidi public against the religious Zionist public in terms of land withdrawals. The statements mirror those made by MK Meir Porush (United Torah Judaism) two weeks ago, when he threatened hareidi boycotts on Judea and Samaria products in response for the ongoing debate on changing laws for hareidi enlistment. At the Opposition debate, hareidi MK Moshe Gafni (UTJ) added on to the backlash against religious Zionism, saying "they say there will be an equal burden. What's the burden? The burden is the religious Zionist institutions, the burden is the isolated settlements, that's the burden." Opposition leader MK Yitzhak Herzog, chairman of the Labor Party, defended the decision to boycott the Knesset bills. "Citizens are asking me in the last few days if (the bills) aren't childish," remarked Herzog. "It isn't a childish administration. The fact is that Israeli citizens are starting to internalize and hear that there are processes going on here crossing the most basic red lines of Israeli democracy." Herzog claimed that at the alternative debate "we are dealing with the most precious issue of democracy." It is worth noting that Herzog has been accused of "treason" in supporting US Secretary of State John Kerry's plans to divide Jerusalem and force Israeli withdrawals from Judea and Samaria. Speaking about the criminal sanctions on hareidi draft dodgers, hareidi MK Yaakov Litzman accused the government of lying. "The prime minister, who sent us representatives promising there won't be criminal sanctions, lied. ...The prime minister boasts all the time that we're the only democracy in the Middle East. I'm not sure that's true." Litzman also warned that Lapid would quickly lose support as occurred to his father, former Shinui party leader Tommy Lapid. Litzman late last year initiated a bill that would have required a majority of MKs to approve any division of Jerusalem. At the time, Jewish Home and Likud-Beytenu were criticized for failing to show up for the vote and letting the bill fail. Arab MK Ibrahim Sarsour spoke out at the meeting, saying sarcastically "thank G-d we have arrived and achieved a moment like this where Jewish and Arab MKs sit together, ready to gobble up the same moldy fruit fed to them by the Israeli government." Sarsour has in the past called terrorist prisoners "political prisoners," and met with senior Hamas figures. Speaking about the meaning of the "protest" Opposition meeting, MK Ariel Atias (Shas) commented "nearly half of the MKs are missing from the full Knesset meeting to bring a clear message. That we may be the minority in this building, but we want to guard our rights."